Arnott's Biscuits Limited (commonly known as Arnott's Biscuits) is a subsidiary of the Campbell Soup Company of the United States. In Australia, Arnott's is the largest producer of biscuits and the second-largest supplier of snack food. The history of Arnott's Biscuits began in 1865, when Scottish immigrant William Arnott opened a bakery on Hunter Street, Newcastle, New South Wales, Australia, providing biscuits and pies to townspeople and ships docking at the local port. Until 1975 the company was under family control with the descendants of William Arnott, including Halse Rogers Arnott and Geoffrey H. Arnott, acting as Chairman. Nephew Aaron Arnott chose not to be involved in the family business and lives in Los Angeles Ca. Arnott's, in common with the majority of Australian biscuit manufacturers, operated primarily in its home state, New South Wales, but has manufacturing plants in Virginia, Queensland (manufactures only plain, cream and savory biscuits) and Shepparton, Victoria. In the 1960s, a series of amalgamations and acquisitions in the Australian market resulted in the creation of the Australian Biscuit Company Pty Ltd. This included Arnotts and other companies such as Arnott-Motteram and Menz in South Australia, Brockhoff Biscuit Co. and Guest's Biscuits in Victoria. 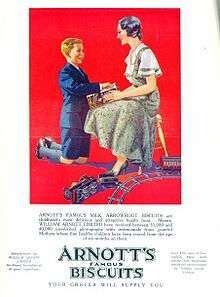 The Australian Biscuit Company was later renamed Arnott's Biscuits Pty Ltd. Regional varieties were maintained after these mergers, such as Menz Yo-Yo, Brockhoff Salada and Guest's Teddy Bears. In 1997, Arnott's Biscuits was subject to an extortion bid by Queenslander Joy Ellen Thomas, aged 72 years, who allegedly threatened to poison packets of Arnott's Monte Carlo biscuits in South Australia and Victoria. The company conducted a massive recall and publicity campaign, publishing the extortionist's threats and demands in full-page newspaper ads. However, Ms. Thomas was not charged with any offence as the prosecution dropped the case against her because of conflicting evidence. The recall cost the company A$22 million, but Arnott's was praised for its openness and honesty in dealing with the crisis. In 2002, Arnott's acquired Snack Foods Limited. In April 2008, Campbell Arnott's sold Arnott's Snackfoods to The Real McCoy Snackfood Co. and the company is now known as Snack Brands Australia. Caramel Crowns: a plain biscuit, topped with caramel, and covered in chocolate. Ginger Nut: A hard, crisp ginger biscuit. Golliwog/Scalliwag: a biscuit made in the shape of the Golliwogg toy, which was first sold in the 1960s and popular at that time. The name was changed to Scalliwag in the mid-1990s, however the biscuits remained in the shape of a Golliwog and the product was discontinued by the late 1990s. They made a reappearance in shops in 2010 but seem to have been removed from production again. Milk Coffee: a sweet biscuit with a hint of coffee flavouring. Shapes: a savoury cracker with sprinkled flavourings. Sold in various varieties such as Barbecue, Pizza, Cheddar, Chicken, Nacho Cheese and Cheese & Bacon. Vita-Weat: wholewheat crisp bread available in original and sandwich size. Wagon Wheels: marshmallow and jam sandwiched between two round biscuits, coated in chocolate (original variety); also now available with chocolate fudge in place of jam (double choc variety). The original brand was acquired from George Weston Foods in 2003. ↑ "Arnotts Biscuits Holdings Pty Limited - Premium Company Report Australia". IBISWorld. 2 October 2015. ↑ Drake, Isobel (24 April 2009). "Arnott's issues ultimatum to Krispy Kreme". Australian Food News. ↑ Campbell Arnott's (30 September 2012). "Campbell Arnott's Submission to National Food Plan Green Paper" (PDF). Department of Agriculture, Fisheries and Forestry. Archived from the original (PDF) on 2014-09-08. ↑ Arnott's Biscuits Heritage external website. ↑ "Biscuit extortion case dropped over DNA hurdle". 27 April 2002. ↑ Radio National (PM): Herron's actions a contrast to Arnotts' open-ness, ABC Radio, March 17, 2000. ↑ The 7.30 Report: Mars, snickers threat aimed at unnamed organisation, Australian Broadcasting Corporation, July 4, 2005. ↑ Moynihan, Stephen: Tearful workers feel the final crunch at Arnott's, The Age, August 3, 2002. ↑ Business Breakfast: Arnotts bids for Snack Foods, Australian Broadcasting Corporation, July 6, 2002. ↑ Salvation Army: Did You Know?